What is New Aadhar Card Password to Open Aadhar Pdf - FreeServiceHindi.com - Free Services in Hindi. Aadhar Card Password 2018: We know that Aadhar Password is necessary to Open the Aadhar Pdf. And we also know that how aadhar is popular and mandatory in most of the Government and Non-Government works. By seeing all these things UIDAI increases its security day by day. And you have noticed it, that few month back you would be able to open your Aadhar pdf by your Area pincode (Means your aadhar password or Aadhar Card Password was your area pin) but as of now you can't. So by seeing these things we also get to know that how UIDAI increases its security. I think 🤔🤔 you are searching for Aadhar Card Password or New Aadhar Card password 2018. Hmm So let's proceed and get the answer of your question 'What is Aadhar Card Password 2018? What is Aadhar Card Password 2018 ? Before proceeding to the Aadhar Card pdf Password I want to ask a question, Have you downloaded your Aadhar Card pdf if not - Here is the Process "How to Download Aadhar Card by Mobile" with the help of Aadhar Number, Enrollment Number & VID. If you have already downloaded Aadhar Card, let's get the Aadhar Card Password. After Sucessfully Downloading the Aadhar pdf, when you will open your e-Aadhar then You may See a Message, " This document is Password Protected, Please Enter a Password." So don't worry if you having the Same issue or if you are not able to Open the Aadhar pdf file. Because here is the Solution to Open the Aadhar pdf file. According to Aadhar, the New Aadhar Card Password is the Combination of first four letters of your name in Capital and year of birth. Having Confusion related aadhar pdf password. 1. If Your Name is Rajaram Kumar and your date of birth is 15th January, 1996. Then your Aadhar pdf password will be RAJA1996. 2. Suppose your name is Rohit Rana and date of birth is 23rd July, 1998. Then Your Aadhar Card pdf Password will be ROHI1998. 3. Assume your Name is G. Gupta and the year of birth is 1979. Your Aadhar Card pdf Password will be G.GU1979. 4. Your Name is Jay Sah and Year of birth is 1999. Your Aadhar Card password will be JAYS1999. As Shown above, Combination of Name and Birth year is the Aadhar Card Password as of 2018. 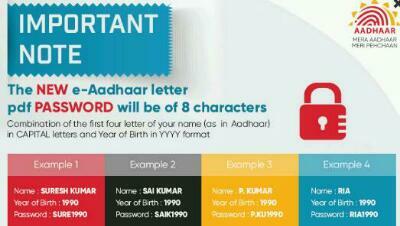 Similarly Combine your Name with your Date of birth and open your Aadhar Pdf. I hope you have got your Aadhar Card Password, or Aadhar Password and unlocked your aadhar pdf which was Password protected, by using the above procedures. If Still having any questions or queries regarding Aadhar Password 2018, then feel free to Comment below.. The project was subsequently introduced in other States in India and through vigorous enrolment drives, many people got their Aadhaar card. adhar card This is an initiative taken by the Government and the Government is bearing the entire cost of the project.